Menulog delivers for Capital Pancakes so you'll be able to track your courier on a map. Comes with maple flavoured syrup and a choice of ice cream or butter. Two pancakes with vanilla ice cream and homemade salted caramel sauce. Two chocolate chip studded pancakes with vanilla ice cream, chocolate fudge and extra chocolate chips. Fresh lemon with sugar and vanilla ice cream on two buttermilk pancakes. Two buttermilk pancakes. Served with strawberry jam and ice cream. Two pancakes, bacon and just one egg. Served with whipped butter and syrup. Two buttermilk pancakes, served with hash brown potatoes and eggs. Two pancakes, bacon and two eggs. Served with whipped butter and syrup. Two blueberry pancakes, bacon and two eggs. Served with whipped butter and syrup. Two pancakes with vanilla ice cream, chocolate fudge and sprinkles. With melting cheese, crisp bacon bits, sour cream and spring onions. Caramelised banana on two buttermilk pancakes. Served with vanilla ice cream, maple flavoured syrup and dusted with cinnamon. 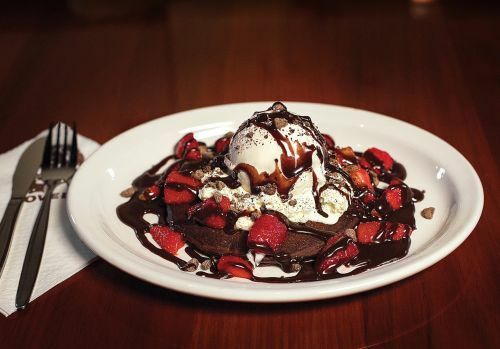 A chocolate pancake with fresh strawberries, ice cream and hot chocolate fudge. A Mediterranean favourite. Seasoned spinach and feta cheese wrapped in two crepes, served with sour cream and leafy salad.